There are few things more difficult than being a single parent. Being a single parent in college is one of those things. No amount of advice could make this an easy experience, but these tips will help you achieve a little more balance. Don’t feel guilty. Due to the time and attention school requires, many single parents feel guilty for even considering college. Remember, the short time you spend in school is just a fraction of your child’s life. The benefit you’ll gain upon completion of your degree will be well worth the sacrifices you (and your child) make during school. Be sure to explain to your child why you are going to school. They may miss you from time to time, but they most certainly will understand why you are doing it. Have reliable help. All college students benefit from a support system. 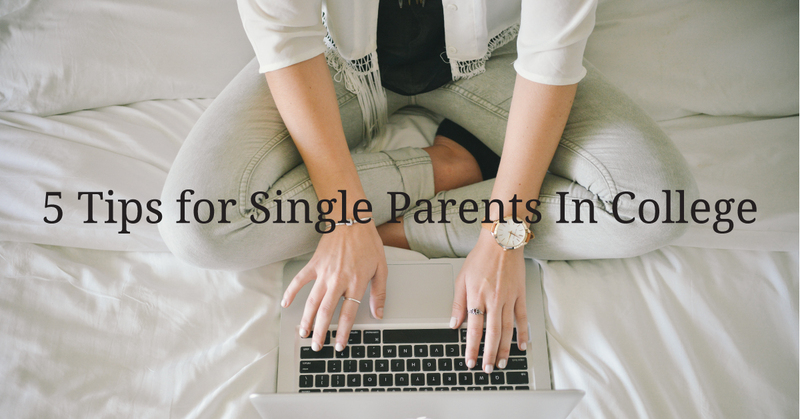 These relationships are essential for single parents. Make sure those around you are committed to helping. Set a schedule in advance so they know when and how often they will need to help. If you don’t have many personal outlets, ask your student services team about programs and resources for childcare assistance. More people are committed to your success than you probably realize. Don’t be afraid to ask for help! Evaluate your study habits. The time and manner in which you studied prior to having a child will likely have to change as a single parent. Find the pockets of time that have minimal impact on quality time with your child. Remind yourself that school only lasts for a set period of time. There IS a light at the end of the tunnel. Make it a family event. If you have a child who is in school, make studying and homework a bonding experience! Do your homework at the same time as your child. This way you aren’t forced to leave their side and they get a first-hand example of how to study appropriately. Prioritize. The top 4 priorities for most single parents in college are family, work, school, and sleep. Make sure you don’t ignore the final priority! If you’re a parent, you’re already used to functioning with little sleep. That may not cut it in college. Your mind and body need more rest to function as a student. Find times to grab a nap or two. It’ll go a long way towards your sanity. Juggling life and family as a single parent is a monumental undertaking. Hold your head up high, be proud of your decision to go back to school, and constantly remind yourself of your new life that awaits after graduation!